(Nanowerk News) Combination of Atomic Force Microscopy (AFM), Raman / Fluorescence / Rayleigh microscopy and Scanning Near-Field Optical Microscopy (SNOM) provides unique opportunities for Graphene investigation. Different AFM techniques allow one to study mechanical, electrical, magnetic and even elastic properties of Graphene flakes. Studies of local work function, conductivity, capacitance, piezoresponse and many other surface properties are also available. 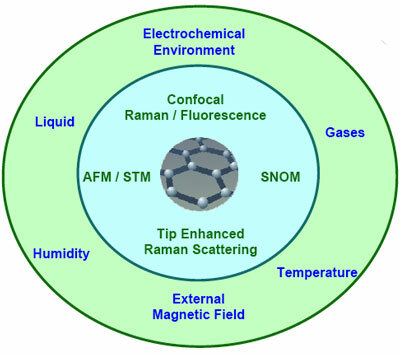 At the same time, Raman microscopy (available simultaneously with AFM) provides information about flake thickness, structural uniformity, presence of impurities and defects etc. Additionally, Rayleigh imaging and SNOM measure local optical properties of the sample providing further information about flake structure. Importantly, most of the measurements can be performed under environmental control: at variable humidity and temperature, in controlled atmosphere, in liquid and even (in some configurations) in electrochemical environment and at the external magnetic field. Instrumentation from NT-MDT, the NTEGRA Spectra, provides the opportunity to carry out all the measurements by the same instrument, on the same sample during the same experiment. It is possible to obtain AFM / Raman / Fluorescence / Rayleigh / maps exactly from the same area during one sample scan. 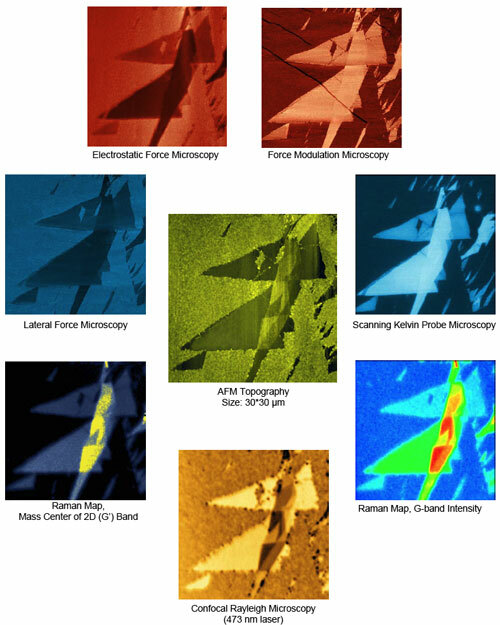 All AFM and spectral data analysis are performed with the same software.